We will be premiering the film by a group of young men who have been working with ArtWorks with the support of Tonypandy Community College and Communities First. For the last three months they have been creating their own film called ‘A Place at the Table’. They have explored their views on education, training and what they want from the future, from their perspective. Following this screening we would like to show you the work that our Community Consultants along with fellow members of the Penygraig Community have been developing as part of our Ideas, People and Places project focusing on regeneration, working with Rabab Ghazoul, photographs by Michal Iwanowski, supported by Artes Mundi and RCT Homes. 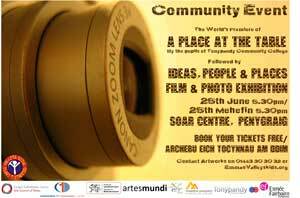 June 26th 6.30pm Soar Centre, Penygraig, Free tickets!